Sales manager for South Dakota company says traffic has been good at his display of vertical feed mixers. Sales manager Rick Rutten says he kept hearing that he needed to bring his New Direction Equipment vertical feed mixers down to Husker Harvest Days. So this year, he decided to make the trip from Sioux Falls, S.D. down to Grand Island. New Direction makes 14 different sizes of vertical mixers, which are used by feedlots to mix rations for cattle. The company has its home office in South Dakota and its manufacturing plant in Manitoba, Canada. He said that the operator loads a round hay bale or other forage into the mixer, adds any supplemental products including grain or DDGS, then lets the mixer do the work of turning the ingredients into a uniform ration. Sales manager Rick Rutten mans the New Directions Equipment booth at Husker Harvest Days. It was NDE's first time as an exhibitor. 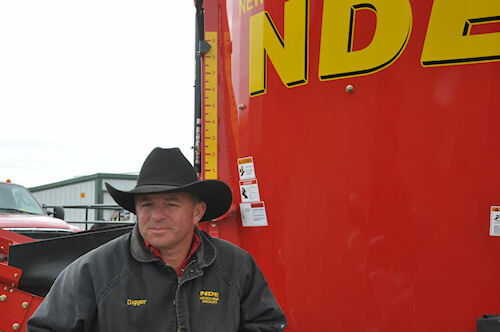 Rutten said traffic has been good at his booth, which is on the back row of the cattle handling equipment area, and he is glad he made the trip to the show. In spite of chilly morning with a threat of rain, the streets of the Husker Harvest showgrounds have been filled with people and exhibitors have had no shortage of people looking over their products. "We've had a lot of people stop by and we already do quite a bit of business in western Kansas," he said. "We won't know just how good we've done from being at the show until we see what kind of response develops later, but it's been busy."